This is the downloadable edition of this book. Ages 5 through 10. 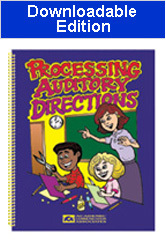 Use the activities in Processing Auditory Directions (PAD) to build listening skills and basic concepts as children process auditory directions. The book emphasizes directions relevant to completing worksheets and various tasks within the classroom. Basic concepts relating to size, location, shape, and time are emphasized. Activities targeting multi-step directions are included. All of the worksheets in Part 1 of the book contain pictures. Each lesson includes two sets of instructions. The two instruction sets can be presented in any order. Reproducible "manipulatives" (e.g., animal cut-outs) are used with some of the activities. Students are asked to place these pictures in various positions on incomplete picture scenes. Suggested strategies are included for working with students who have communication disorders. The activities can also be helpful in programs for second language learners. All of the worksheets may be reproduced.